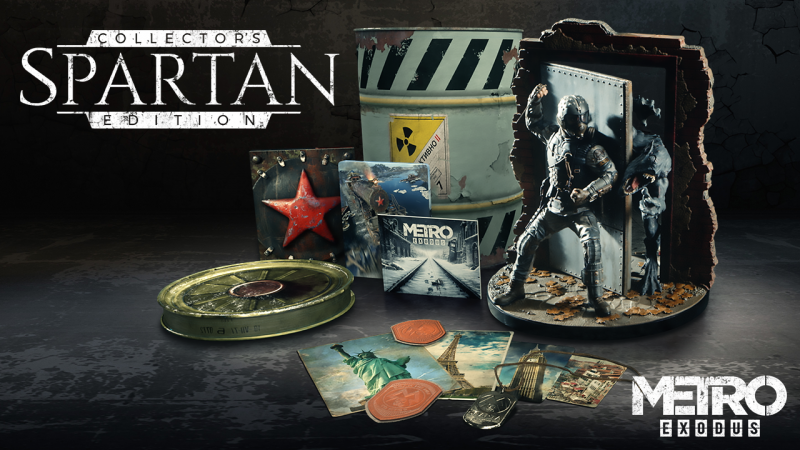 Deep Silver and 4A Games have announced the Metro Exodus Spartan Collector’s Edition. This collector’s edition is limited to 4,000 units and includes a premium Artyom statue and several other collectibles. The statue stands at 10.5 inches and features Artyom fighting off a watchman. In addition, the package includes a Spartan Order dog tag, collectible postcards, and Spartan Order patches. The collector’s edition ships in a giant barrel-shaped package based on in-game barrels. The collector’s edition can be purchase with or without the game. If you choose to include the game with the package, you can choose to include the Aurora limited edition, which comes in a steelbook case and features an art book and the Metro Exodus expansion pass. The standalone collector’s edition (no game included) costs $150, while the version bundled with the Aurora limited edition of Metro Exodus costs $235. You can see a trailer for the collector’s edition below. Metro Exodus launches on PlayStation 4, Xbox One, and PC on February 22. This Collector’s Edition is available exclusively from the official Metro site.